These things we see played out every day. Each laying hen flock selects a bird to be at the bottom of the pecking order, and they pick on her. 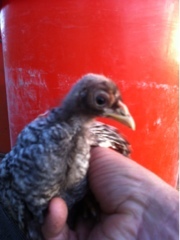 This gal is the bottom of the flock of hens that went out of the brooder yesterday. The other birds have heads full of feathers, and are not bald. Hen pecked means exactly the same thing: hens pick at the one all day every day. Egg on her face? A hen caught doing something she should never do, cracking open the shell and eating the contents. Caught doing something she is in real trouble for doing. We keep this poor gal with her group. If we pull her for protection they just select another to beat up.